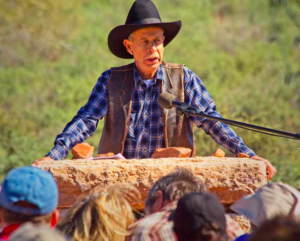 Every year on or around the Dutchman’s anniversary of when he died, October 25, people from all over the world who hunt for the Lost Dutchman Mine gather for a weekend event in the foothills of the Superstition Mountains. Discussions, tales, and talks will take place next Saturday night, October 28th at 6:00pm. Ron Feldman, the owner of Mammoth Mine Rock Shop and long time hunter of the mine will be one of the featured speakers! Can you tell me the date of the anniversary gathering for this year.